Salsa. It makes the world a better place. Like seriously, it really, truly does. 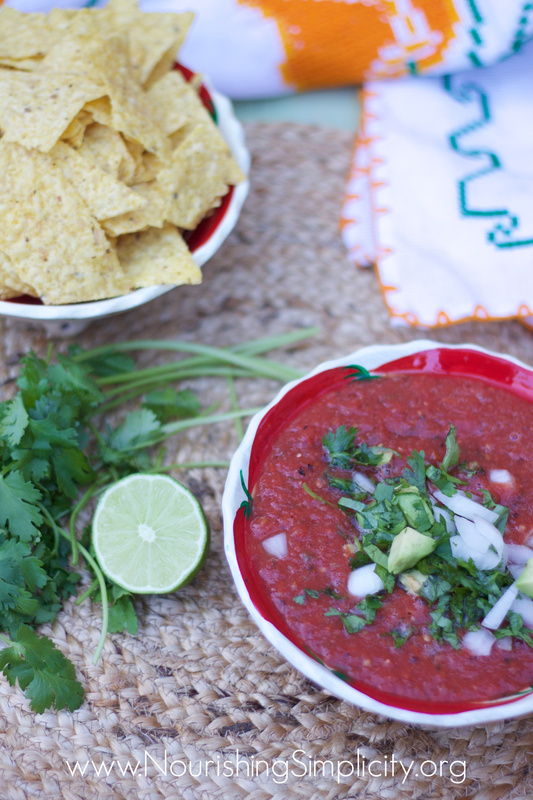 This lacto-fermented roasted red salsa with avocado may be my favourite. A week without salsa is a very sad week indeed. Even a few days without it is sad. Do you always find yourself reaching for a jar of salsa when you are shopping at the store? Has it been relegated to that list of things you don’t make? I regress. Salsa. You can make it yourself. It will be delicious, it take only a few minutes, and you will have everyone that eats it asking for more. You might ask what is a white girl, who was born in the Mid-west and lives in California is doing trying to teach you how to make salsa. Well, here is the deal, I learned in the best place from some of the best cooks. For those of you that haven’t followed me from years back, I lived in Mexico for 10 years. I moved south of the border when I was 19 to be a missionary at a school for the Deaf. Even though I wasn’t the cook, I did a lot of the cooking in my early years there and was taught of some of the essential Mexican dishes when we did have a cook. When we didn’t have a cook, I had to put those newly learned skills to the test by cooking for 50-100+ people a few times a week. 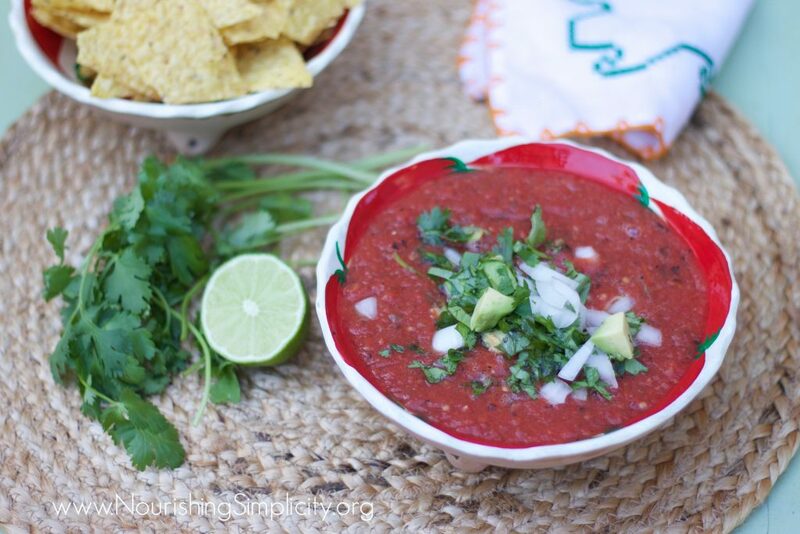 Salsa was one of the first things I learned to make. That and tortillas, rice, and beans. Basically, the essentials that are the backbone of the culture. 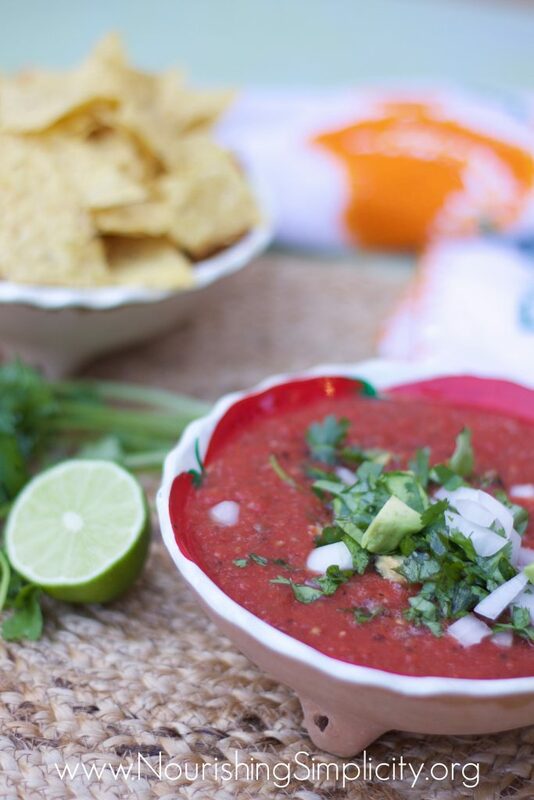 There are endless types of salsa that can be made. I love almost all of them. I don’t think that there is a homemade salsa that I have met that I don’t enjoy. My little recipe box has had those first recipes that I learned in it since I was 19. After a while the recipes in my head and heart. I am constantly on the quest to learn to make a new salsa, often inspired by ones I have had at someone’s home, or at a favourite restaurant. There are countless ways to make salsa; fresh chopped salsa like pico de gallo, salsa made from boiled tomatoes and chilies, green salsa made from tomatillos, and roasted salsas. I enjoy all of them, yet salsa made from roasted tomatoes and chilies is of my favourites. Such a deep flavor comes from tomatoes that have have been roasted over a gas stove, in a frying pan, or under a broiler. 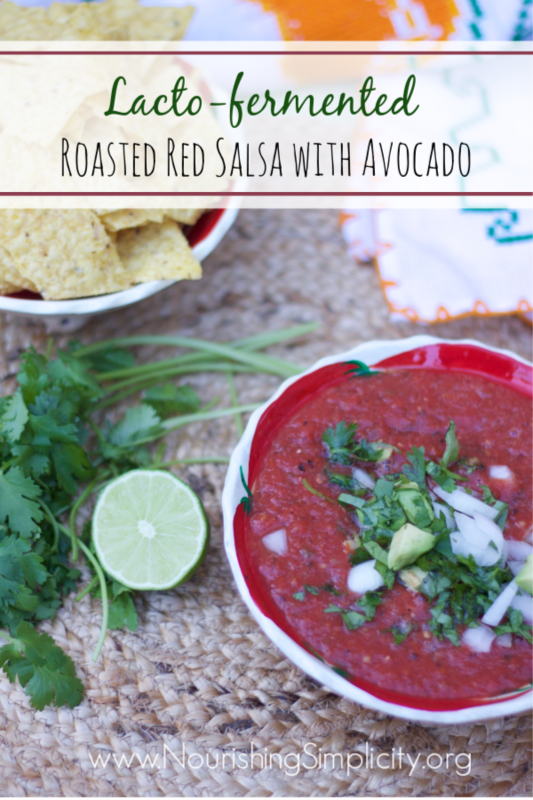 Lacto-fermented roasted red salsa with avocado for a fun twist is the one I try to keep on hand. A couple of years ago the garden at the school where I work was overflowing with tomatoes. I took a bunch home and made this salsa and left it in the lunchroom with a couple bags of chips. By noon it was almost gone, all 3- quarts of it folks! I knew that I had found a winner. My heart was tickled when all the Mexican ladies started asking me for my recipe. 😉 After that, I become one of the go-to gals to ask Mexican cooking questions. Big hat tip to all the ladies in Baja that taught me to cook. The beauty of this salsa it that it can be lacto-fermented for long-term storage and a boost to your gut-health, or you can skip that step and simply eat it as is! Place the tomatoes and jalepeños a single layer in an oven safe pan. Broil until blistered and slightly blackened, flipping occasionally. Prep the onion, cilantro, and avocado while they broil. Blend the tomatoes, jalepeños, garlic, lime juice, whey, and salt until smooth. Pour into a bowl, add the prepared onion, cilantro, and avocado. Transfer to a mason jar and lightly covered with a lid. Leave on the counter for 12-48 hours, then transfer to the refrigerator. It will last for several months, though normally we go through it much quicker than that. If you chose to skip the fermentation step, leave out the whey and transfer to the refrigerator immediately. It will last for about one week. 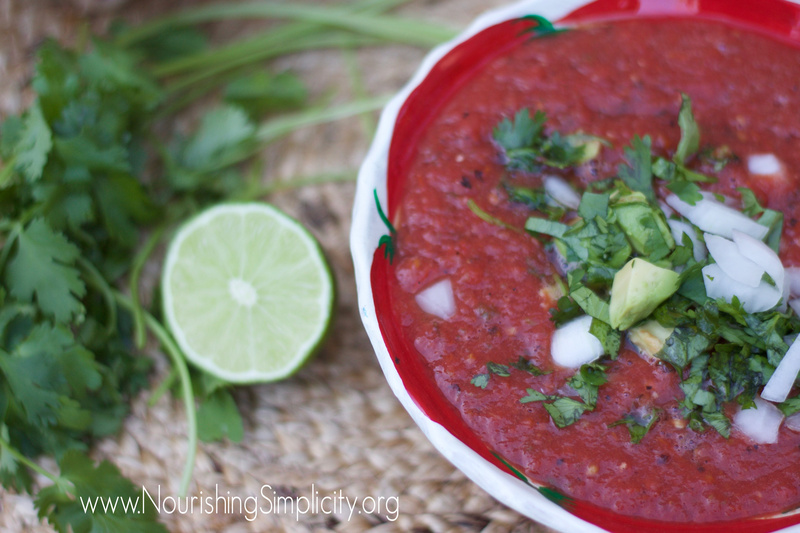 If you still want to ferment the salsa but make it dairy-free, leave out the whey and increase the salt to 1 tablespoon.